Sewage backflow into a Folsom residence, caused by a clogged main sewer line on the property. This is a very real and serious health hazard and should be remediated by trained personnel immediately! 1. Safety first. Inform all personnel to stay out of the area. 2. Extract raw sewage, do rough cleaning with low pressure bio-cide rinse and extract. 3. Remove personal contents from the area that have not come in contact with black water or sewage. 4. 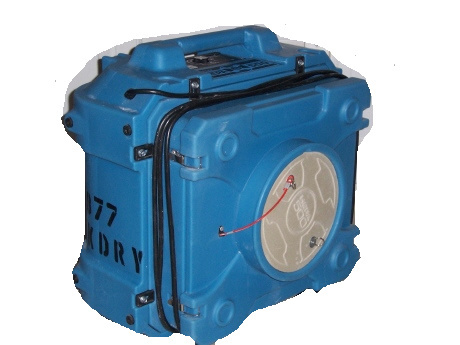 Set up air flow and dust control containment and keep the affected area under negative air pressure controls with an negative air scrubber machine. 5. 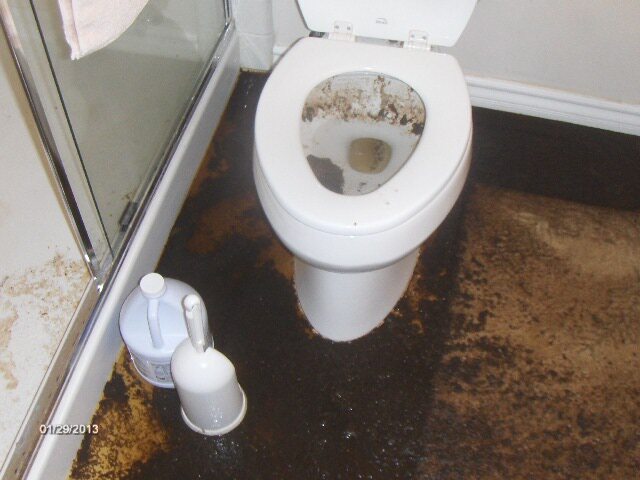 Remove and discard all absorbent materials that have come in contact with black water and sewage. Including but not limited to: Carpet, padding, tack strips, baseboards, door framing, vinyl, linoleum, drywall / sheetrock, finish wood flooring, laminate, etc. 6. Low pressure rinse and extract exposed wood framing and sub-flooring materials with anti-microbial bio-cide, rinse carefully and repeat. 7. Dry savable wood framing and sub-flooring materials with dehumidifiers only. DO NOT USE FANS. FANS (high velocity air flow) can spread pathogens (bacteria, viruses and parasites) to unwanted areas. 8. Clean any cross contaminated areas, like carpets, other flooring door knobs, etc., with anti-microbial cleaners. 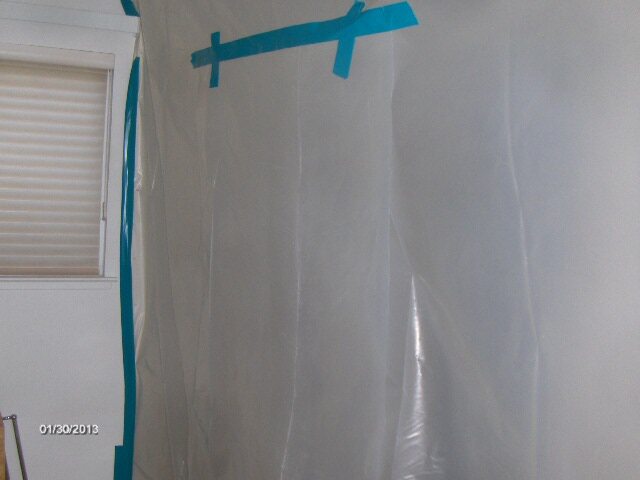 Air flow and dust control plastic containment used to separate the affected area from the rest of the house. HEPA AIR SCRUBBER, USED TO HELP CLEAN THE AIR ON WATER DAMAGE JOBS THAT INVOLVE SEWAGE OR MOLD ISSUES. Insurance covered claim? Ask how we can help with your dedcuctible. For Folsom CA homeowners and renters sewage back ups can be devastating ruining private property, spreading illness and disease, and possibly causing death. According the Natural Resources Defense Council (NDRC) over 2 million illnesses are caused each year by sewage contamination. Flood or sewage back up water contains a number of harmful contaminants, bacteria, and viruses that are dangerous to humans and animals. From diarrhea to mild infection and liver failure there are a host of symptoms related to sewage contamination. In addition to residuals from pharmaceuticals, pesticides, and other toxic substances sewage waters also contain dangerous fungi, bacteria, amoeba, and protozoan. There are literally hundreds of other strains of bacteria, viruses, and other organisms that may be present in flood or sewage waters. If you or any family member has come into contact with sewage waters there is a good chance you may become ill. If you or a family member exhibit any symptoms of sewage contamination such as abdominal cramping, fever, or diarrhea seek medical attention immediately.